Nestled between the scenic Jamaica mountains and turquoise Caribbean waters, along shores that once served as the site of an 18th century estate, this all-inclusive haven exudes an unforgettable ambiance in a stunning tropical setting. Minutes from Montego Bay’s airport, Hilton Rose Hall Resort & Spa features luxurious modern accommodations, 2,500 feet of enhanced sandy beachfront, the exhilarating Sugar Mills Falls Water Park, kids club, teen zone, superb dining outlets, optional full-service spa, championship golf nearby, shopping shuttle, over 41,000 square feet of meeting and event facilities, memorable wedding and honeymoon packages, and more. 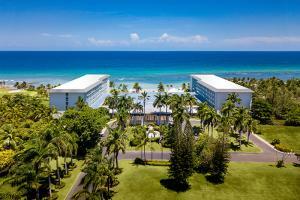 Just 15 miles from dazzling Montego Bay and only 15 minutes from the airport. Annie’s Smokehouse BBQ – Jamaican smoked BBQ; Bar King Frog – Open-air patio sitting; Blue Mountain Coffee; 7 Juice Bars – tropical juices, smoothies; Fresh – Overlooking the Caribbean; Luna di Mare – Fine Italian and extensive wine list; Mangoes – Jamaican-influenced salads, burgers, sandwiches, tropical drinks; Mark’s Jerk Hut – Fresh jerk dishes; Moonstone di Mare – Pizzeria by day, Pasta Bar by Night; Seaside Restaurant & Bar – Overlooking the sea; Three Palms – Overlooking the golf course, unique culinary creations. Rose Hall Great House, Montego Bay Marine Park, Greenwood Great House, Bob Marley Performance Center, Martha Brae Rafting, Duty-Free Straw Market, Montego Bay, Coral Cliff Casino, Dunns River Falls.